I spend a lot of time in the kitchen with my girls, as you know. And, despite beginning to teach both of my girls some essential knife skills (aged 2 and 5) I do still like to make sure that access to most of my kitchen accessories, especially knives, is restricted and the Joseph Joseph LockBlock is a a brand-new and innovative knife block which is designed to balance the style of Joseph Joseph kitchenware with the practicality and safety. I think you'll agree, the knife block looks fab and, although my kitchen isn't as pristine and white as the picture above (it isn't pristine and anything, hence why I opted for the stock photo rather than my own photos for a change!) it fits in perfectly with my modern (ish) kitchen. 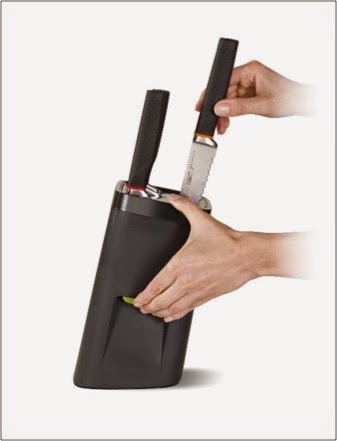 The Joseph Joseph LockBlock comes either with an awesome set of Japanese stainless steel knives (£150), or as a standalone unit with no knives (£60) - the slots for the knives are for universal knife shapes and sizes so you can use your own knives in it. As the mother to a very mischievous preschooler, I think the design of the LockBlock is brilliant. 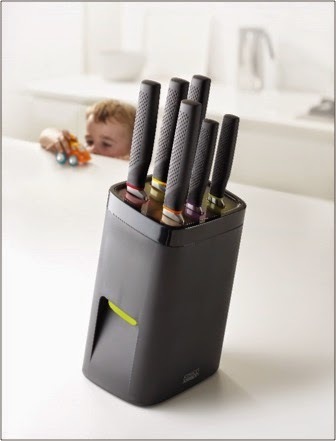 As a keen cook, I would much rather keep my prized kitchen knives in a knife block where they are easily accessible to me and where they will not get jumbled up with all of the other utensils in a drawer. However, I gave up using a knife block when Lara was about 2 and started being able to reach up to the kitchen worktops and placed everything in a drawer that I could secure with a latch. It feels great to be able to use a knife block again without the worry. And I'm certainly not worried... Lara has seen me use the release mechanism and understands how it works but she isn't able to operate it because her hand span isn't big enough. Result! The other thing I like about the Joseph Joseph LockBlock is that there is a protective cover over the top of the knife slots which allows for easy cleaning. Another reason for having moved away from a traditional knife block in the past was that dirt, dust and gunk disappeared inside the slots for the knives. With the LockBlock, the top one inch of the block is a removable, cleanable plastic cover which adds a level of protection above the slots to reduce the amount of gunk that can get in. All in all, I'm very impressed by the LockBlock and I think it is a great addition to a family kitchen, such as ours.